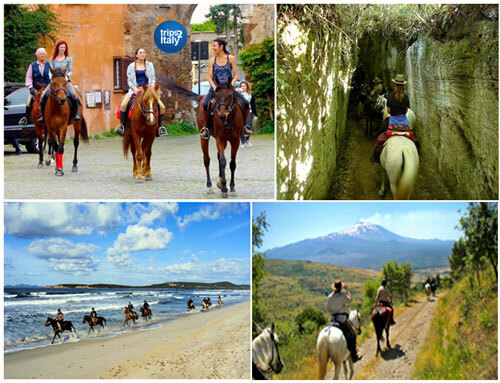 Enjoy Horseback Riding In Italy! Some say that nature is best experienced while horseback riding. For travelers who are looking to experience the wonders of Italy’s national landscapes atop a horse, areas all over the country offer a variety of equestrian experiences. From the country’s towering mountains and plateaus, through the rolling countryside, and all the way to the cliffside coastline, Italy gives riders of all experience levels a unique immersion into nature and an escape from the hassles of daily life. Lake Garda, which divides the Northern regions of Veneto, Trentino Alto-Adige, and Lombardy, offers a treasure trove of scenery that can be experienced on horseback. The horse trails of the area offer great views of the lake and the surrounding mountains. Some of the most unique trails are those along the Mincio River, which connect the Dolomites with the lake, offering stables and farmhouses in between at which to rest and relax. For riders traveling to the Emilia Romagna region, the Bologna Apennines offer a variety of horseback riding trails. Areas such as Mt. San Pietro, Marzabotto, and Rioveggio give travelers the chance to take in wonderful hill country views in the tranquility of nature. A truly special experience is a ride through the quiet Sanctuary of Montovolo, where one will see ancient villages and a variety of locations with religious importance. In Piedmont, experience the history of Italy’s wine culture by taking rides through the Via dei Vini (road of wine). Or take trails to see famous medieval structures such as the castle of Grinzane Cavour or the ancient tower, Dongione of Serralunga D’Alba. In Lombardy is the Valle d’Intelvi (Intelvi Valley), a picturesque valley which connects Lakes Como and Lugano. Charming villages, sparkling water, and fertile greenery await. Horses can traverse trails on either side of the valley, exposing riders to once-in-a-lifetime views. Umbria is a region with unparalleled landscapes, making it the ideal location to enjoy horseback riding. Many areas of the region offer great trails, including the town of Umbertide and the area of Monti Sibillini.